Mizumoto, A. (2012). Exploring the effects of self-efficacy on vocabulary learning strategies. Studies in Self-Access Learning Journal, 3(4), 423-437. This study examined the effects of self-efficacy on language learning strategies by focusing on vocabulary learning strategies (VLSs). A group of 281 EFL learners from two universities participated in the study. They completed the Vocabulary Size Test (Nation & Beglar, 2007), questionnaires on self-efficacy, and an open-ended question about their use of VLSs. The learners were divided into three groups based on their responses to the self-efficacy questionnaire. The effect of self-efficacy was then examined by utilizing text mining. The results show that the effects of self-efficacy were observed in the participants’ open-ended responses. It also became clear that those with high self-efficacy were active users of VLSs, they employed deep strategies, and they were metacognitively superior to participants with medium and low efficiency. Those with medium self-efficacy were also active users of VLSs, but they used shallow strategies compared with the high self-efficiency group. Those with low self-efficacy tended to be passive users of VLSs. The pedagogical implications of the current study are discussed mainly in terms of incorporating self-efficacy and self-regulation enhancing instructions into vocabulary teaching. Research on language learning strategies (or language learner strategies) has a history of almost forty years. The field has accumulated a wealth of knowledge about how learners deal with language learning strategically. Accordingly, it has firmly established itself as a research field in applied linguistics (Cohen & Macaro, 2007; Oxford, 2011). In recent years, the field of language learning strategies has come under severe criticism mainly because of its definitional fuzziness and lack of rigorous measurement (Dörnyei, 2005; Tseng, Dörnyei, & Schmitt, 2006).2 In response to this criticism, researchers in the field have attempted to provide a more detailed framework (Macaro, 2006; Weinstein, Acee, & Jung, 2011). Another direction is the inclusion of self-regulated learning, in which learners have control over cognitive, metacognitive, and emotional processes in learning. Because learning strategies are an integral component of self-regulated learning, we can look at the bigger picture of learning processes and thus give extensive definitions of language learning strategies in terms of “strategic learning” (e.g., Oxford, 2011; Rose, 2012a). Whatever framework a researcher uses to investigate language learning strategies, the “goal” is of utmost importance for strategic learning (see Takeuchi, Ikeda, & Mizumoto, 2012, for a review of theoretical framework). Macaro (2006) argues that “a strategy must conform to the algorithm: if in a learning situation/task X, and when the learning goal is Y, then try mental action Z” (p. 329). He also notes that “the presence of a goal is a necessary condition for the construct of a strategy. Goals are, of course, also recognised components of motivation” (p. 330). Learning strategies thus can be defined as conscious mental actions that are driven by goals. Self-regulated learning is likewise fueled by goals. Considering the importance of goals and motivation in strategic learning and self-regulated learning, it is natural for researchers to propose a new model that incorporates goals and motivation. “A model of motivated vocabulary learning” (Tseng & Schmitt, 2008) is such an attempt. Based on the process model of L2 motivation (Dörnyei & Ottó, 1998), Tseng and Schmitt tested their model with structural equation modeling (SEM) and found it to be tenable. They divided the vocabulary learning process into three phases: the preactional, actional, and postactional phases. The model assumes vocabulary learning as a cyclic process (Table 1) with the postactional phase exercising further influence on the preactional phase to continue the learning process. Tseng and Schmitt’s model of motivated vocabulary learning is similar to Zimmerman’s (1989) model of self-regulated learning, which considers self-regulated learning as a process. Zimmerman’s model also has three phases: forethought, performance or volitional control, and self-reflection. In this model, three components are prerequisites for self-regulated learning: (a) the use of self-regulated learning strategies, (b) self-efficacy, and (c) goal orientations. With (a) learning strategies and (c) goal orientations present as discussed above, the remaining element is (b) self-efficacy. Self-efficacy, a concept originally developed by Bandura (1977), refers to “the belief in one’s capabilities to organize and execute the courses of action required to manage prospective situations” (Bandura, 1995, p. 2). In the field of applied linguistics, it has been demonstrated that self-efficacy does the following: (a) influences motivation (Kormos, Kiddle, & Csizér, 2011), (b) promotes learner strategy use (Magogwe & Oliver, 2007), and (c) is high if the learner is autonomous (Ching, 2002). From these findings, it is evident that self-efficacy plays a vital role in language learning. Yet no study to date has investigated the effects of self-efficacy on one specific domain of learning strategies. For assessing strategic learning, it has been suggested that we should “situate the construct in one particular only” (Tseng, Dörnyei, & Schmitt, 2006, p. 86) and use qualitative data collection instruments (Rose, 2012a) because successful learning depends on the orchestration of strategies, not the frequency of strategy use conventionally measured with questionnaires (Macaro, 2006; Rose, 2012a). In the current study, therefore, I will examine the effects of self-efficacy on language learning strategies by focusing on vocabulary learning strategies (VLSs), and the VLSs will be measured in an open-ended format. The research question of the current study is as follows: Can the effects of self-efficacy be found in the participants’ responses to the open-ended question of VLSs? The study was conducted in 2010 and 2011. The participants were 281 Japanese university EFL learners at two private universities in western Japan (humanities or engineering majors; 92 females, 189 males; aged 18–20; lower intermediate level). The participants were first asked to indicate their level of agreement with the following statement: “I can learn and master vocabulary in my own way.” They indicated either “Yes,” “Not sure,” or “No” as an indicator of their level of self-efficacy. In addition, to confirm that the participants’ responses reflected their self-efficacy, a six-point Likert scale questionnaire was administered. The questionnaire comprised 10 items to measure self-efficacy. The items were selected from previous studies such as Tseng and Schmitt (2008). For VLSs, the participants answered the following open-ended question in Japanese: How do (did) you intentionally learn vocabulary? As described in the previous section, I purposefully phrased the question about participants’ use of VLSs as open-ended because successful learning is not fully manifested in the frequency of strategy use. In order to measure the participants’ vocabulary knowledge, the first 60 items (First 1,000 to Sixth 1,000) of the Vocabulary Size Test (Nation & Beglar, 2007) were given to the participants in addition to the three aforementioned measures. Only the first 60 items from the test were used because previous studies indicate that the average vocabulary size for Japanese EFL university students was much lower than 6,000 words (e.g., Mochizuki & Aizawa, 2000). Table 2 is a summary of the measures used in the current study. All the analyses in this study were conducted using R version 2.13.0. For Self-efficacy (1), the number of “Yes,” “Not sure,” and “No” responses was counted. Descriptive statistics and Cronbach’s α coefficients were obtained for the two continuous measures, Self-efficacy (2) and vocabulary size. In order to confirm that the selected categories for Self-efficacy (1) were reliable, a one-way ANOVA was carried out with the selected categories of Self-efficacy (1) as an independent variable and Self-efficacy (2) as a dependent variable. Likewise, a one-way ANOVA was conducted using vocabulary size as the dependent variable to check the effects of self-efficacy on vocabulary knowledge. Because two ANOVAs were run, the alpha level for the ANOVA was set at .025 with the Bonferroni adjustment (0.05/2). Following one-way ANOVAs, post hoc multiple comparison tests were performed using the Tukey procedure. The open-ended question of the use of VLSs was analyzed using RMeCab (rmecab.jp), the Japanese text mining package for R. Characteristic words, which are more frequently used in the text, can be extracted with this text mining package. As a result, 939 words were extracted, and 196 words common to all three categories of Self-efficacy (1) were used for analysis. To address the research question of the current study, “Can the effects of self-efficacy be found in the participants’ responses to the open-ended question of VLSs?,” a correspondence analysis was employed (see Hair, Black, Babin, Anderson, & Tatham, 2006 for a detailed explanation). With the use of a correspondence analysis, we can obtain a graphical representation of the relationships among the categories of a contingency table with a smaller number of latent dimensions. In this study, correspondence between the selected categories of Self-efficacy (1) and 196 words from text mining (3 × 196 matrix) was thus examined using a correspondence analysis. The descriptive statistics and Cronbach’s α coefficients of Self-efficacy (2) and the Vocabulary Size Test are displayed in Table 4. Reliability coefficients for the two measures were relatively high. Table 5 presents a summary of the results of one-way ANOVAs and post hoc multiple comparison tests with the Tukey procedure. One-way ANOVAs confirmed that statistically significant differences were found in the means of the three groups in terms of Self-efficacy (2) and the vocabulary test. Furthermore, the results of post hoc multiple comparison tests showed that statistically significant differences existed in all pairwise comparisons in Self-efficacy (2) and the vocabulary test. These results suggest that those who answered “Yes” in Self-efficacy (1) have higher self-efficacy and a larger vocabulary size than those who answered “Not sure” or “No.” In the same way, those who answered “Not sure” have higher self-efficacy and a larger vocabulary size than those who answered “No.” The fact that there were differences in Self-efficacy (2) confirms that the responses of the participants in regard to Self-efficacy (1) were appropriate. In regard to vocabulary size, it has been demonstrated that the higher the self-efficacy, the larger the participant’s vocabulary size tends to be. In other words, learners with a larger vocabulary size have confidence in their method of learning and mastering vocabulary. The results of correspondence analysis are visually displayed in two dimensions (Figure 1). In this figure, three categories of Self-efficacy (1) and 196 words are placed according to the results of correspondence analysis. The selected categories are marked as “Yes,” “Not sure,” and “No” in the figure. In correspondence analysis, the dimensions are interpreted based on the association among the row and column categories of a contingency table (in the current study, three categories and words). The words close to each category in Figure 1 are the characteristics of the participants’ use of VLSs belonging to each category of Self-efficacy (1). In the first dimension, the category “Yes” is situated in the left, and the category “Not sure” in the right. 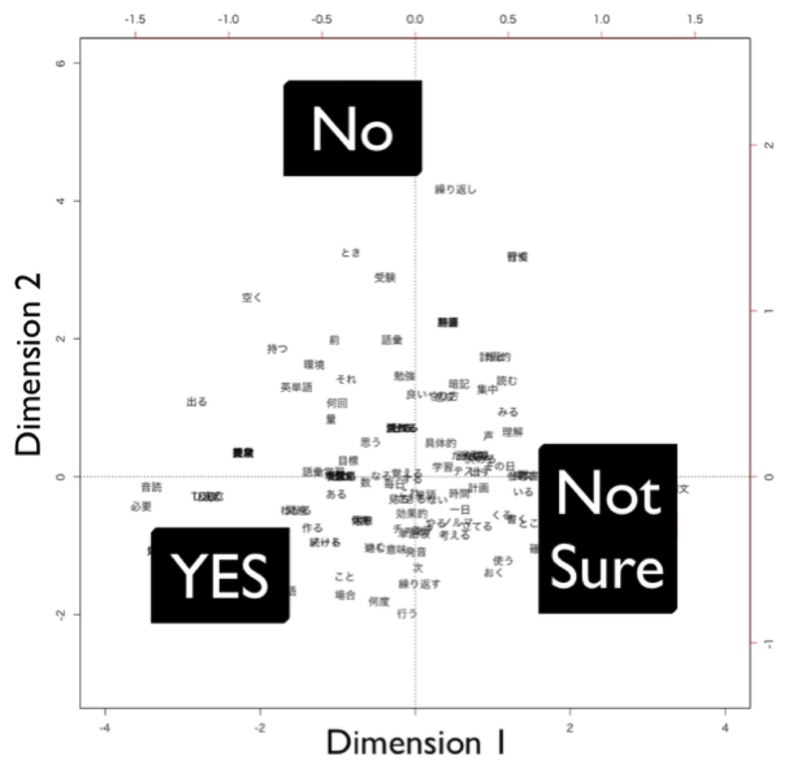 In the second dimension, the category “No” is at the top, and “Yes” and “Not sure” are at the bottom. From these excerpts, it can be interpreted that those who answered “Not sure” or “Yes” were more active and focused in their vocabulary learning. However, those who answered “Not sure” seem to consider that vocabulary learning requires effort, and as a result, they use “shallow” rote learning. In contrast, those who answered “Yes” seem to seek efficiency and use “deep” vocabulary learning strategies, as can be construed from their excerpts, in their vocabulary learning. Thus, the difference between those who answered “Not sure” and “Yes” to Self-efficacy (1) could be the use of “shallow” or “deep” strategies. In order to look for better, efficient, and deeper ways of vocabulary learning, a higher level of metacognition is necessary. In other words, learners with high self-efficacy excel in metacognition and flexibility of strategy deployment. By the same token, participants who answered “Not sure” can be encouraged to move to the level of “Yes” by employing metacognitive strategies and seeking deep strategies in vocabulary learning. 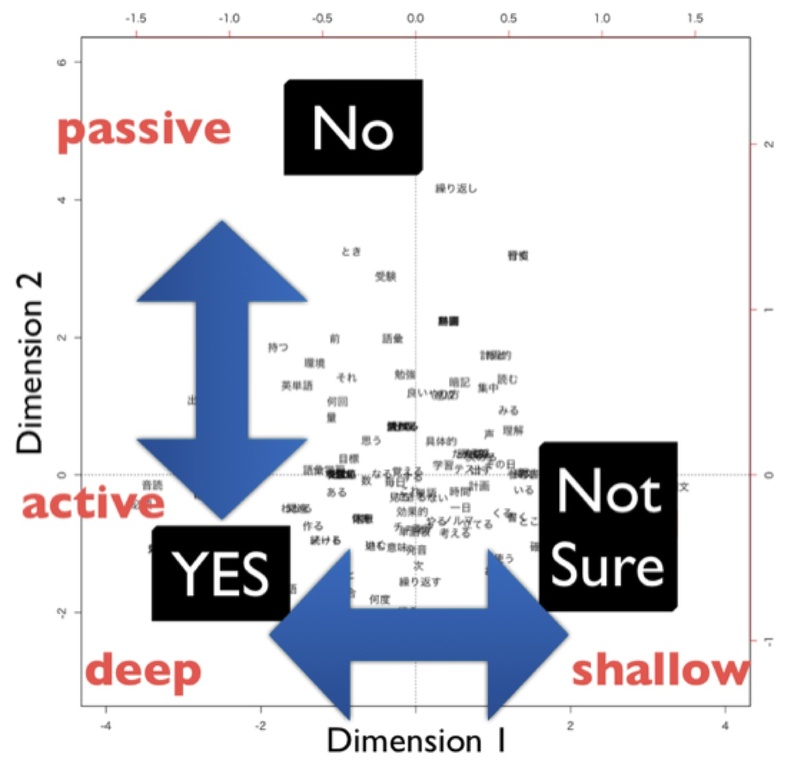 These excerpts suggest that the second dimension may represent the contrast between “passive” learners (i.e., those who answered “No”) and “positive” learners of vocabulary (i.e., those who answered “Yes” or “Not sure”). If we draw on the definition of self-regulated learning, this contrast can be explained. According to Zimmerman (1989), self-regulated learners are “metacognitively, motivationally, and behaviorally active participants in their own learning process” (p. 329). From this perspective, it can be assumed that those who answered “No” to Self-efficacy (1) are passive learners, while those who answered “Yes” or “Not sure” are more active learners. All these interpretations are illustrated in Figure 2. Figure 2. Results of Correspondence Analysis with the Double-headed Arrows and Interpretations for Each Dimension. Based on these results, the response to the research question “Can the effects of self-efficacy be found in the participants’ responses to the open-ended question of VLSs?” is that, as the results of text mining and correspondence analysis show, the effects of self-efficacy can indeed be found in the responses to open-ended questions of VLSs. The current study aimed at exploring the effects of self-efficacy on the use of VLSs. The results show that the different degrees of self-efficacy can explain the difference of learners’ vocabulary size. In VLSs, too, the effects of self-efficacy were observed in the participants’ open-ended responses. The results of text mining and correspondence analysis demonstrated that those with high self-efficacy (participants in the “Yes” response category) are active users of VLSs, they employ deep strategies, and they are metacognitively superior to participants with medium and low efficiency. Those with medium self-efficacy (participants in the “Not sure” category) are also active users of VLSs, but they use shallow strategies compared with the high self-efficiency group. Those with low self-efficacy (participants in the “No” category) tend to be passive users of VLSs. The findings of the current study have two pedagogical implications. First, self-efficacy enhancement is an important component in vocabulary learning and teaching. This may be possible with teaching VLSs. Mizumoto and Takeuchi’s (2009) study, which explored the effectiveness of explicit instruction of VLSs, suggested that teaching VLSs could lead to an increase in motivation. Although Mizumoto and Takeuchi’s study did not measure the change in self-efficacy, it implied that teaching learning strategies may increase self-efficacy (Graham & Macaro, 2008). It is thus likely that VLS instruction can enhance self-efficacy in the same way. Second, as self-efficacy is an influential factor in self-regulated learning, incorporating the instruction of self-regulated learning, especially focusing on metacognition training, may be useful for learners. Research has shown that instruction on self-regulated learning can enhance self-efficacy (Zimmerman, Bonner, & Kovach, 1996). I suggest instruction on self-regulated learning in addition to VLSs instruction here because the research framework of self-regulated learning can provide a bigger picture of the learning process, including learning strategies, metacognition, and motivation. We are now at a crossroad in language learning strategy research. After a wave of criticism, the field has redefined itself by including, for example, more detailed and extensive definitions of strategies (Oxford, 2011; Rose, 2012b; Macaro, 2006) and the analysis of self-regulated learning (Tseng, Dörnyei, & Schmitt, 2006). As Rose (2012a) argues, “This is an exciting time to conduct research into strategic learning” (p. 146). I also believe that strategic learning is a fruitful area of research because we have accumulated findings from previous research stretching almost 40 years. Now is the best time to apply all these findings (and a new research framework) to help our students become more autonomous learners. This research was made possible by a Grant-in-aid for Scientific Research (No. 24720276) from the Japan Society for the Promotion of Science. 1. Part of this article is based on my previous report written in Japanese (http://www.kansai-u.ac.jp/fl/publication/department.html#a05). 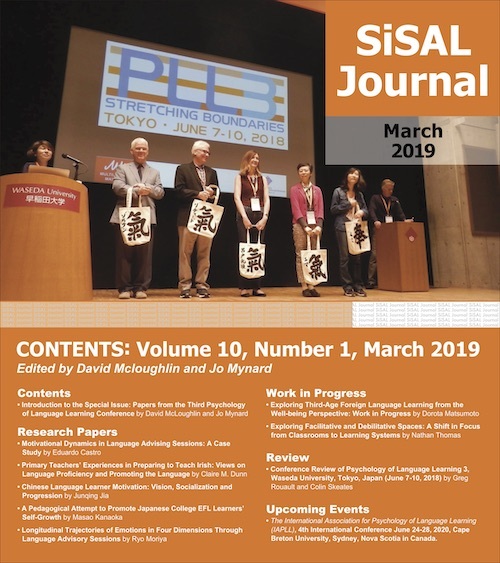 I thank the Faculty of Foreign Language Studies, Kansai University for letting me publish this article in English. 2. See Gao (2007) and Rose (2012b) for a critique and discussion of these claims. Atsushi Mizumoto, Ph.D. Foreign Language Education, is an Associate Professor of Applied Linguistics at the Faculty of Foreign Language Studies, Kansai University, Japan. His current research interests include vocabulary learning strategies, language testing, and assessment. Bandura, A. (1995). Self-efficacy in changing societies. New York, NY: Cambridge University Press. Ching, L. C. (2002). Strategy and self-regulation instruction as contributors to improving students’ cognitive model in an ESL programme. English for Specific Purposes, 13, 261–289. Cohen, A. D., & Macaro, E. (Eds.) (2007). Language learner strategies: Thirty years of research and practice. Oxford, UK: Oxford University Press. Dörnyei, Z. (2005). The psychology of the language learner: Individual differences in second language acquisition. Mahwah, NJ: Lawrence Erlbaum Associates. Hair, J. F., Black, W. C., Babin, B. J., Anderson, R. E., & Tatham, R. L. (2006). Multivariate data analysis (6th ed.). Upper Saddle River, NJ: Pearson Prentice Hall. Nation, P., & Beglar, D. (2007). A vocabulary size test. The Language Teacher, 31(7), 9–13. Oxford, R. L. (2011). Teaching and researching language learning strategies. London, UK: Pearson Longman. Rose, H. (2012a). Language learning strategy research: Where do we go from here? Studies in Self-Access Learning Journal, 3(2), 137–148. Zimmerman, B. J., Bonner, S., & Kovach, R. (1996). Developing self-regulated learners: Beyond achievement to self-efficacy. Washington, DC: American Psychological Association.